SuperGrover has worked his socks off to bring you a thoroughly comprehensive review of each and every team in the Premier League, providing his rating and insightful analysis on each team's performances and how they have turned these into results. A truly great read, this first part covers the current top six teams. Stay tuned to this site this week for the rest of the teams. SOT. The festive holiday period presented games fast and furious, with numerous exciting and interesting results. Rather than a week-by-week review, I have decided to use this time to present a midseason team summary for each Premier League squad. The summary consists of shot data (both for and against), expected goals (scored and allowed), and team ratings both for the full season and over the past six game weeks. In addition, I offer a bit of my own analysis. Hope you enjoy and a Happy New Year to everyone! Note: Percentages represent difference with league average. Defensive percentages have been reversed meaning a negative percentage actually represents defensive performance below league average. Numbers do not include Chelsea-Southampton Wednesday game. 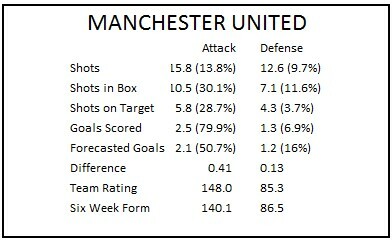 Starting at the head of the table we have the attacking juggernaut that is Manchester United. The Red Devils have dominated all-comers offensively, scoring seemingly at will whenever they threaten. While the underlying numbers suggest Man U. have been a bit lucky offensively (2.5 goals per game is probably not sustainable - it was last season, SoT! ), they are, and most certainly will continue to be, the best attacking team in the league (along with their cross-town rivals, of course). Defensively, Man U. have been better in seasons past although they have allowed a few more goals than one would have expected given their shot and chance numbers. Anecdotally, it seems teams have attempted to outscore United on occasion, believing their backline can be had (the Reading game a prime example). This is a much different strategy than has been applied to many other elite sides and probably somewhat responsible for the higher than expected goals on both sides of the pitch. Prediction: Normalcy returns offensively somewhat and the backline stiffens a bit. Expect a slight reduction in goals on both sides the remainder of the season, but nothing that impacts their championship march. The defending champions have had quite the first half. Sitting seven points off United, City needs to get untracked in a hurry if a repeat is in the cards. 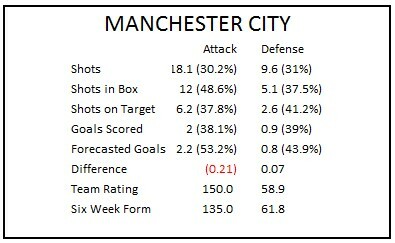 Offensively, City have really struggled this season. Statistically, they look every bit as dominant as they did last year, but they simply haven’t converted. How much of this is due to Aguero’s fitness issues is unknown, but this team should be scoring more than they are. Fun Fact: Chelsea has 6 penalties scored and has only hit the woodwork 2 all season. Both numbers are easily the best among the top table teams. Spurs are an interesting club. A mishmash of parts with world class talents sprinkled in (Bale, Vertonghen). Adebayor, in particular, seems a bit out of place at times and one might wonder if his trip to ACN may allow AVB to find a better fit up front. 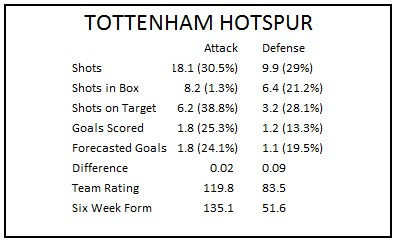 Statistically, Spurs rely on shots outside the box more than most elite attacks, primarily a result of Bale’s proclivity from 18+ yards out. 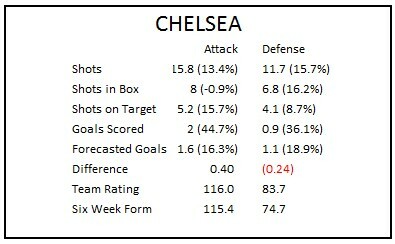 With that said, their shots on target are as expected and they neatly fit into the model for goals scored. Maybe the most pleasant surprise of the season. Everton were expected to be solid, but probably not legitimately compete for the top five. They are and I expect they will continue to do so presuming fitness. 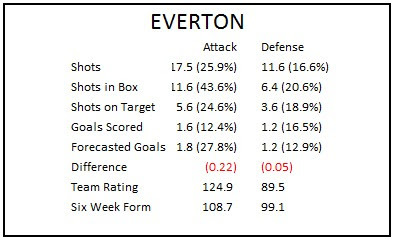 Offensively, Everton havr dominated statistically. Fellaini and Jelavic represent physically dominant players and they’ve been able to get into the box against even the best opposition. However, neither have prove to be exactly a clinical striker, Jelavic suprisngly but Fellaini not so, and the resulting conversion rates have been a major drag on goals scored. Prediction: Everton continue to be statistically elite, but lack the quality that begets precision finishing necessary to challenge for a top 4 slot. Clean sheets come more regularly, but tough away fixtures doom Everton to a dog fight for a Europa slot. Arsenal are in a battle to continue their run of UCL qualifications. Given the entirety of the first half of the season, one would think qualification is unlikely. However, Arsenal have been better when Walcott has been fit (both as a winger and a central forward) so I do believe the chance remains. To do so, Arsenal are going to need improvement on both ends of the pitch. 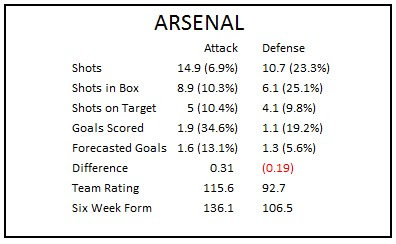 Offensively, Arsenal generate fewer shots than any other elite side. While this has improved with Walcott, that improvement needs to continue. Defensively, Arsenal are still prone to gaffs, as evidenced by their 12 errors leading to goal, the most in the league. This absolutely must stop or Arsenal may find themselves shut out of Europe altogether. What does the Difference row signify..? It represents the difference in projected goals scored/allowed and actual goals scored/allowed. Basically, it represents the margin a team is under or over performing the model.